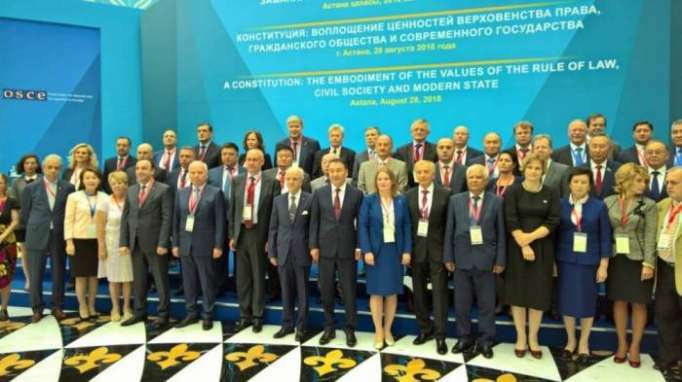 A delegation of Azerbaijan`s Constitutional Court led by chairman Farhad Abdullayev has attended an international conference in Astana, Kazakhstan. The conference marked the Day of Constitution of Kazakhstan. The event was attended by Venice Commission officials, representatives and scientists from the Russian Federation, Turkey, Ukraine, Bulgaria, Latvia, Belarus, Georgia, Germany, Jordan, Algeria and other countries. Addressing the event, Farhad Abdullayev highlighted constitutional and legal reforms carried out in Azerbaijan. President of Kazakhstan Nursultan Nazarbayev received heads of delegations taking part in the conference at his Presidential Palace.